MOSCOW (AP) — A Soyuz capsule carrying an American, Russian and Italian successfully docked Wednesday with the International Space Station, where the new crew will spend six months conducting a variety of experiments. The docking took place at 8:10 a.m. (0210 GMT, 10:10 p.m. EDT) less than six hours after the Russian spacecraft lifted off from the Baikonur Cosmodrome, which Russia leases in Kazakhstan. Live footage provided by NASA TV showed it soaring into the clear night sky. About four minutes later, the announcer said the Soyuz was traveling at 4,700 miles per hour (about 7,500 kilometers per hour). The cramped capsule carrying NASA's Karen Nyberg, Russian cosmonaut Fyodor Yurchikhin and Italy's Luca Parmitano orbited the Earth four times before docking with the space station. 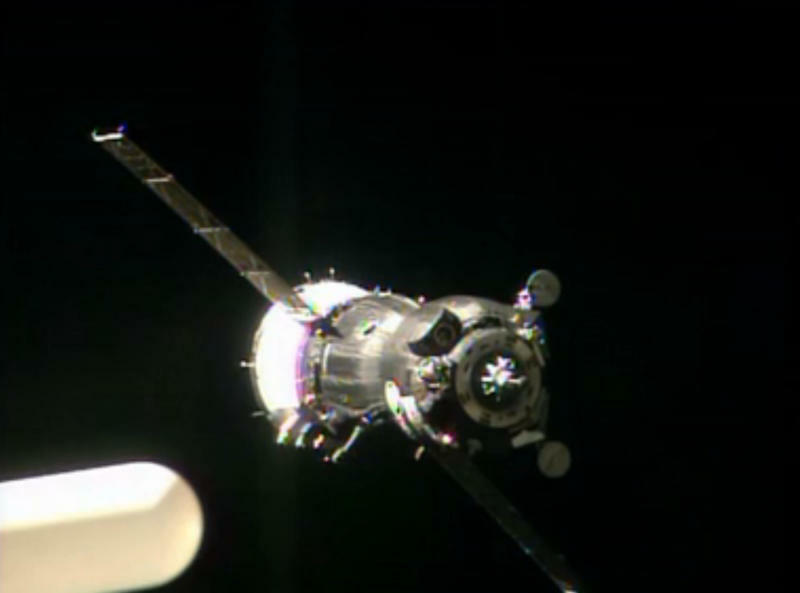 After docking, two hours passed before pressure equalized between the capsule and the station, allowing safe entry. The three new arrivals were greeted by NASA's Chris Cassidy and Russians Alexander Misurkin and the station's commander Pavel Vinogradov, who have been aboard the space station since late March. "It was a pretty cool ride," Nyberg said upon arrival. Cassidy had shaved his head clean to match Parmitano's look and got a thumbs-up from the Italian. Yurchikhin, 54, is a veteran of three previous spaceflights, while the 36-year-old Parmitano, a former test pilot, is making his first trip into space. Nyberg, 43, spent two weeks in space in 2008 as part of a U.S. space shuttle crew. Shortly after their arrival, the incoming team spoke via video link with their relatives and officials back in Baikonur. Parmitano's mother wept throughout the chat with her son. Four spacewalks are planned during the expedition, including what NASA said would be the first by an Italian. The International Space Station is the biggest orbiting outpost ever built and can sometimes be seen from Earth with the naked eye. It consists of more than a dozen modules built by the United States, Russia, Canada, Japan and the European Space Agency.